Last week new interpretive signs were installed at Main Street Garden to showcase architecture surrounding the active park. 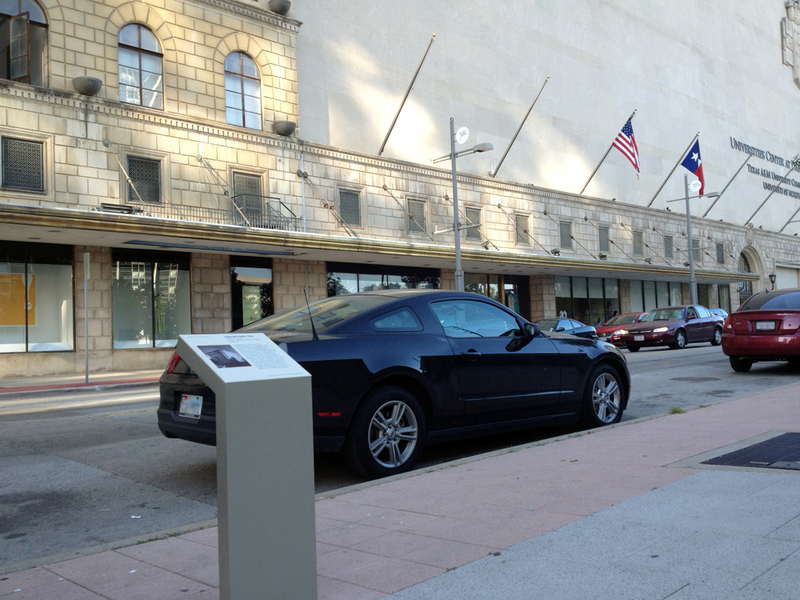 In the works for several years, these news signs serve as the first demonstration project in a program hoped to expand to other areas of downtown Dallas. Preservation Dallas created the sign program in memory of Gail Thoma Patterson, a longtime supporter and former president of the organization. Contributions from William D. Lautman inspired the project, and production of the signs included involvement from Phoenix 1 Restoration and Construction and Gallagher & Associates. Nestled beside street furniture and trees along the perimeter of the park, the signs are noticeable without being obtrusive. The sleek metal design blends in with the surrounding landscape, and the graphics include a historical photo beside text telling the history of the structure. 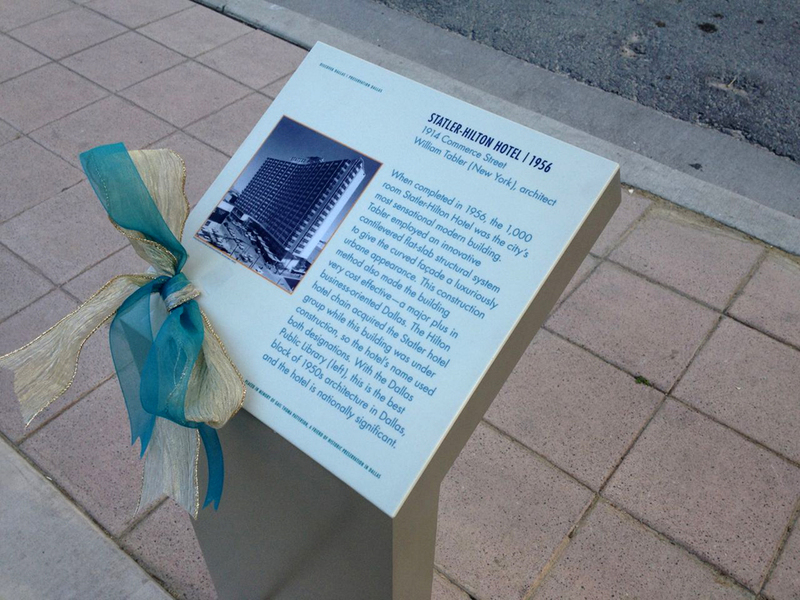 Located at waist level and across the street from the buildings, the signs are positioned in a way to allow viewers to look up and study the architecture from a distance. The modern design of the signs enhance the streetscape. This one describes the Titche-Goettinger Building. Main Street Garden was chosen as the first location for interpretive signs due to the variety of architecture surrounding the park. The Titche-Goettinger Building, Hilton Hotel (now Hotel Indigo), Municipal Building, Dallas Public Library and Statler-Hilton showcase the city’s diverse architecture all built within a 50 year timespan. Many of the structures contribute to the Harwood Historic District, and the opening of Main Street Garden in 2009 allowed for grand vistas and new appreciation for the buildings. There are numerous areas this program could be expanded in the future, and Preservation Dallas is hopeful that private building owners will want to highlight their building’s history to the public. As downtown Dallas continues to revitalize — with new restaurants, shops and residents — the Gail Thoma Patterson signage program will be an excellent way to share the neighborhood’s story to both visitors and residents. Stop to learn more about the neighborhood the next time you visit Main Street Garden.